The new DLC is out for Left 4 Dead and Left 4 Dead 2 for PC and Xbox as of October 5th. The DLC is for both the first L4D and L4D2. The Sacrifice features a prequel to the previous DLC “The Passing.” The DLC tells the story of how Bill meets his boom, my favorite character! 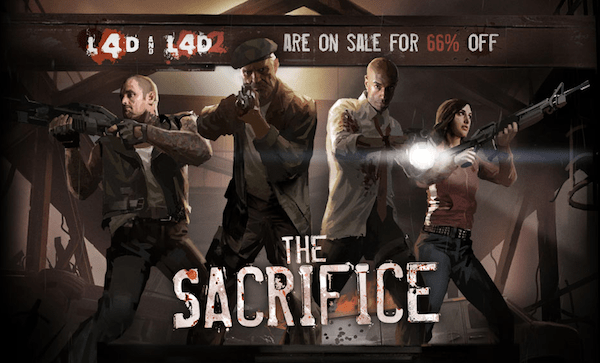 The Sacrifice, for L4D2 players, will also come with the No Mercy level from L4D. Also big news L4D2 is out for Mac on Steam! Not only is it out on Steam but it’s also 66% off right now. So you can get Left 4 Dead and Left for Dead 2 for $19.99 each or pay $59.99 for a 4 pack and gift 3 of them to your friends. Because you know Left 4 Dead just isn’t as much fun without your friends fighting by your side. So far only Left 4 Dead 2 is available on Mac so Left 4 dead fans will just have to wait for that one. So if you are fortunate enough to own a newer Mac that can play Steam games then what are you waiting for? jump in it! WordBooker WordPress Plugin – Rocks My Socks Off! Hitachi Duo Pro 4TB External Hard Drive for 269.99 on Woot Today!